If you’re looking to start a business directory, then an important thing you need to decide is whether you will create a general directory or you will take the niche route. There are successful niche directories like Angie’s List as well as general directories like Yellow Pages. So, which one should you build? Whether you should niche by industry or location? These are some important questions to consider while you’re starting your directory niche site. If you are confused with all these questions, then read on. We will discuss everything you need to consider before building a business directory site. The idea of niching down may seem puzzling. Isn’t the more the better? Not always. Niching down may offer you some advantages in getting found online. Biggest advantage of niching down is branding. People within your niche will know that your website exists specifically for their industry. There are many niche directories which are even bigger than general directories because people use them more finding that specific business. Another advantage is niching down helps in your online discoverability. It will help you in SEO as Google will prefer to show your website for your niche related search queries. When you niche down it also helps with advertising. The business who is paying for advertising in your directory will get highly targeted audience if your directory is in that niche. So, you will be able to charge higher. But there’s also a disadvantage of niching down. You are limited to a particular industry which means less number of business. But running a general directory will also mean you need more resources for outreach, SEO, advertising and other things. So, if you’re starting with limited resources and budget, it makes sense to have a niche for your directory site. If you decide to niche down, there are two ways of doing it. You can niche by category or location. Two common ways of niching down is either by location or by category. Let us discuss a bit of each type of directory. In this type, you can create a general directory but for a specific location. So, for example you create a directory for all businesses – hair salons, plumbers, wedding photographers and more in Dallas. You can consider this type of directory if you want to market your site within a specific location. In this type of niche directory, you decide on a specific category or industry or a group of businesses or industry. Angie’s List is a famous example in this model. This type of category selection helps you in SEO and online marketing. Plus, after you get initial success you can always add more related niches. Another way to create a niche directory site is to combine both location and category. For example, directory for kitchen remodeling company in New York. But before you do this, you should consider whether there are enough businesses and search for your category in your chosen location. Now that we know different ways of choosing a niche, let us look at few important things to consider while choosing a category niche. If you’ve decided to select the category or industry for your directory, you should take note of some important points. You won’t want to invest money to buy a directory theme, buy hosting, and invest time on building the directory while not making enough money. So, we have listed few pointers that should help you to make a profitable niche directory. An important criteria while choosing a niche is to select a business category which has high average transaction value per customer. What does this mean? This means that you choose a business whose customer or client pay him a good amount for each business deal. Do you know what is the average transaction for kitchen remodeling business? Their average ticket size is almost 22,000 USD per customer according to HomeAdvisor. So, even if you bring them one customer through your directory website that would mean 22,000 USD business for them. So, they won’t mind paying you 200 USD if you give them few leads per month. But if you choose businesses which have low earning per customer, it would be difficult for you to charge them a good amount. 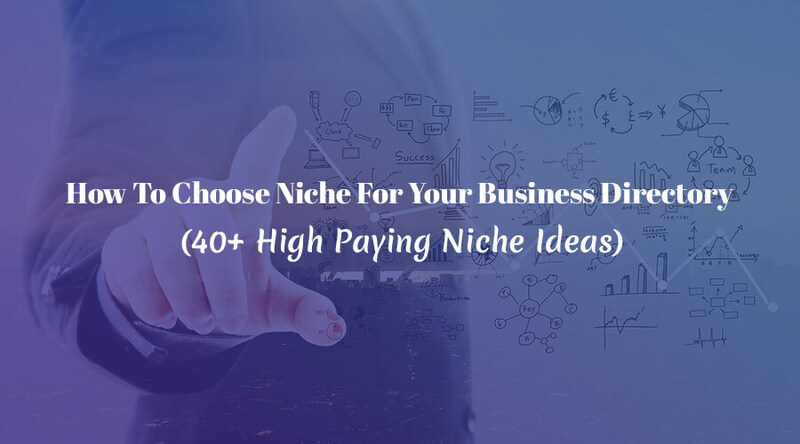 Second important criteria to consider while choosing a niche is to consider whether you have any prior relation to any niche which is lucrative. Apart from running a digital business, you may have offline experience with any niche. May be you worked or you have friends who can introduce you to certain niche. If you have any sort of experience in any niche it will help you to network. But if you don’t have any experience, there’s nothing to worry. You can search some facebook and linkedin groups and start building relationships. And to gain more knowledge in that niche, you can start browsing different niche forums and Quora. Third important criteria to consider is whether the businesses in that niche the city you’re targeting have a healthy competition. Do they even need leads? Consider the scenario where there are only a couple of businesses within that niche in a particular city. Do you think they would need you for leads? No. They know that customers, at last, go to them. So, look for the number of businesses. If the number of businesses is too less, then it’s not a good idea to target that niche in that city. Maybe, you should target another demography. Another country or another state. An easy to validate is to search your businesses on Google, call them and ask whether they would pay you if you bring them leads? If they say yes, go for it. If no, look for a different niche. The fourth thing to consider is how easy is to reach out to the business owner. If you find it difficult to reach out the business owner or the marketing manager, then you will have a hard time in outreaching and making money within that niche. Fifth thing to consider is whether the business category is seasonal or evergreen. So, if its a seasonal business like Snow Removal they won’t pay you for the whole year. So, it’s better to avoid niches which are seasonal. The businesses in the category should be willing to pay you for bringing them leads. If you’re building a local directory site it’s important to choose the correct niche. If you choose a niche which is not popular, you will end up wasting your time and money. In this article, we have discussed the important things to consider while choosing a niche category for your directory. We have also listed some high paying niche ideas which you can consider while building your directory. Do you have any suggestions for choosing a niche or category for your directory? Share your insights with us in the comment section.